Plummet Line’s title bid in Division Two of the Haslem Sheppard Halifax AFL has received a boost from league chiefs. They have been awarded the points from their fixture away to lowly Hebden Royd Red Star Reserves on February 17. Star won 6-5 at White Lee Rec, Mytholmroyd to inflict a first league defeat of the season on Plummet. However, the Calder Valley side have pleaded guilty to playing an ineligible player. It means Plummet have re-established a five point lead over St Columba’s, who beat them 3-0 last weekend. Both sides have six games left. As expected, Division One leaders Denholme United have been awarded the points from the February 24 fixture at home to Calder ‘76 Reserves, who were unable to raise a team. 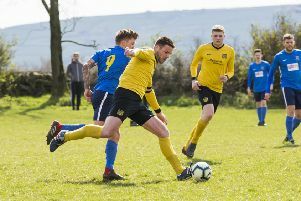 Division Two side Midgley United Reserves and third division outfit Stainland United have benefitted in similar fashion when their opponents, AFC Crossley’s Reserves and Brighouse Sports Reserves, failed to fulfil fixtures.